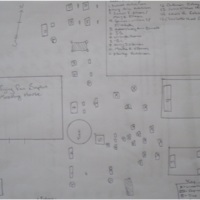 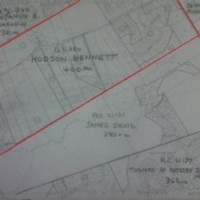 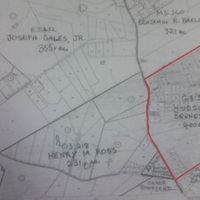 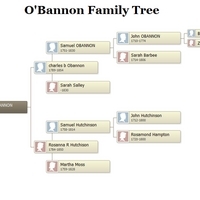 Hand-drawn map showing the grounds and gravestones located in Frying Pan Cemetery, Herndon, VA.
O'Bannon Family Tree tracing the family's ancestry from Henry J. O'Bannon to Bryon Boru O'Bannon's immigration from Ireland. 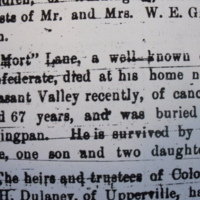 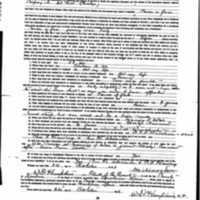 Document from the U.S. Confederate Pensions 1884-1958 for Mortimer Lane. 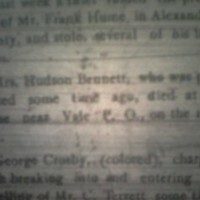 Article from the Fairfax herald March 25, 1887 detailing the death of Lucy Ann Bennett, wife to Hudson Bennett. 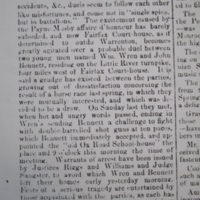 Article from the Alexandria Gazette Sept 3, 1874 on a dispute between John C. Bennett and William Wren. 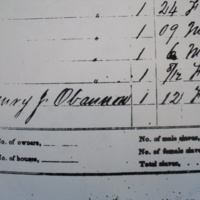 Image taken from the 1860 Slave Schedules for Loudoun Co., Va. Shows that Henry J. O'Bannon owned one female slave, aged 12. 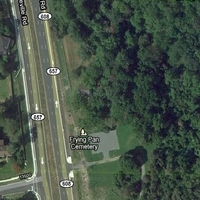 Satellite map showing the location of Frying Pan Parka and Cemetery.